"Credit in the Straight World"
"Brand - New - Life"
Young Marble Giants were a post-punk band formed in Cardiff, Wales in 1978. A trio, their music was constructed around the powerful and minimal instrumentation of brothers Philip and Stuart Moxham along with the vocals of Alison Statton. Stuart Moxham wrote the majority of the band's songs, and his writing was often deceptively simple-seeming, giving the YMG's classic work a uniquely fragile yet powerful quality. Centered around a weird mix of Philip's steel-hawser bass, Stuart's punchy rhythm guitar (played on a mapleglo Rickenbacker 425) and haunting, rhythmic Galanti electric organ lines, with Statton's vocals tentatively suspended in the space between them, their sound was unlike anything anyone had heard before. Stuart Moxham's girlfriend Wendy Smith lent Stuart the money to buy the Rickenbacker. Wendy, an art student in Cardiff (and later in Nottingham) at the time the YMG's were forming, also designed cover art for several singles and albums by Weekend and The Gist, Stuart Moxham's later project. Wendy also accompanied the band on their tour of the US, and shot a set of seminal photographs of the band. Very early in their existence, there was a fourth member of the band, Peter Joyce, Phil and Stuart Moxham's cousin. Joyce was a telephone engineer and an electronics whizz, who had made his own synthesiser from a kit. This was a small touch-sensitive keyboard with an attache case-like box of circuitry, with several knobs and dials. It made sounds similar to Eno's synths in the early Roxy Music and Kraftwerk, who employed similar 'low-tech/high-tech' electronics. The YMGs used tape recordings of Peter's home-made drum machine (Roland didn't release the Boss DR-55, the first fully programmable drum machine, until 1979), since they had no desire to have a drummer. They were also interested in (by today's standards primitive) state of the art effects devices such as ring modulators and reverb units, with the emphasis always on simplicity. The band toured and played in the US and Europe, and played in San Francisco, Vancouver, New York, Berlin. Touring companions included the band Cabaret Voltaire. Musical influences included Eno, Kraftwerk, Neil Young, Lou Reed, The Velvet Underground, Roxy Music, David Bowie, Can and others. The band were acquainted with Scritti Politti, the band of Cardiff native Green Gartside, and ended up signed to the same label, Rough Trade Records. It was revealed in the 2003 book Journals that the band were, along with Scotland's The Vaselines, Kurt Cobain's favourite band. 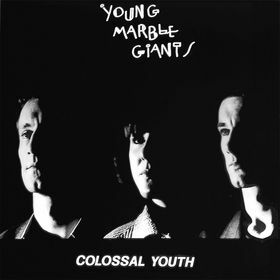 Courtney Love's band Hole covered the Young Marble Giants track "Credit In The Straight World". Peter Buck of R.E.M. is another self-confessed fan of the YMGs. Stuart Moxham was a fan of Manchester guitarist Vini Reilly's early work, and was also very interested in Dub Reggae.